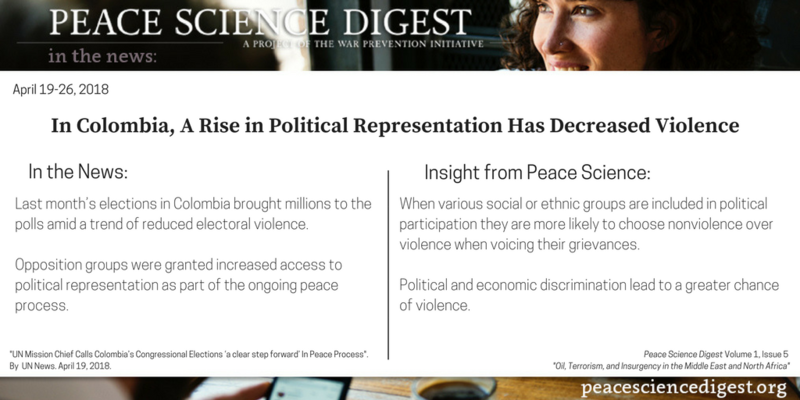 In Colombia, opposition groups were granted increased access to political representation as part of the ongoing peace process. Which, thus far, has proven successful in reducing violence at the polls. “While it is too early to take stock of a peace process that has set ambitious and long-term goals, we already observed that it has achieved a notable reduction of violence in the congressional elections. Among legislative developments, the Constitutional Court had endorsed the Law on the Status of the Opposition, which among other things provides opposition parties with access to media, funding and representation in the Senate and the Chamber of Representatives for runners-ups in vice-and presidential elections.” –Jean Arnault, head of the UN Verification Mission in Colombia, set up two years ago to monitor and support implementation of the peace deal. When various social or ethnic groups are included in political participation they are more likely to choose nonviolence over violence when voicing their grievances. Political and economic discrimination lead to a greater chance of violence. “UN Mission Chief Calls Colombia’s Congressional Elections ‘a clear step forward’ In Peace Process”. UN News. April 19, 2018. Peace Science Digest Volume 1, Issue 5: “Oil, Terrorism, and Insurgency in the Middle East and North Africa”. Next article Media Outlets Have A Choice - Why Do So Few Choose Peace Journalism? Previous article Can We Fight And Broker Peace Agreements At The Same Time?